The building located at 301-305 South Sanford Avenue in Georgetown, an historic African-American neighborhood in Sanford, Florida. The earliest known occupant of Suite 301 was resident Julia Tony. W. E. Hawkins later resided at this address in 1917. By 1924, Hamrick's Cash Grocer was operating from this site and Naaman Siplin and Dora Jones were residing in 301 1/2 South Sanford Avenue. Just-Rite Grocery replaced Hamrick's by 1926. In that same year, George Williams, Eugene Slappey, Ernest Bray, Catherine Graham were residing at 301 1/2. Lonnie Cherry resided at Suite 301 1/2 in 1947 and Luke Wright resided here in 1965. From approximately 1947 to 1952, the Afro-American Life Insurance Company was listed at 301 South Sanford Avenue. The office was originally located at 413 1/2 South Sanford Avenue in 1924 and then moved next door to Suite 411 in 1926. The company, which also operated as a financial institution, was founded by Abraham Lincoln Lewis and others in Jacksonville. Buying insurance had previously been difficult and unaffordable for most African Americans before Afro-American Life Insurance Co. was established in 1901. The company closed in 1990. This particular building was listed as vacant in 1965. All of the residents listed above between 1924 and 1947 were African Americans. Hawkins & Warren was the first known occupants of Suite 303 in 1911. In 1917, G. Saucer resided at this address. By 1924, this lot was being occupied by Hawkins Brothers Meats and then by Kennington & Nesmith Meats in 1926. Ernest B. Sizemore operated his grocery store at Suite 303 in 1947 and Robert Frazer was listed as a resident at 303 1/2 South Sanford Avenue. Campbell's Fish Market was listed at this address in 1952. By 1965, this suite was vacant. In 1975, Knights Bicycle Shop was located here, after moving from 414 South Sanford Avenue sometime after 1965. The earliest known occupant of 305 South Sanford Avenue was resident William Papall in 1911. By 1917, J. D. Bonner and Dr. Edward. D. Strickland resided at this address. Dr. Strickland was a successful black dentist. By 1926, he had moved his residence to 511 South Sanford Avenue, where a new two-story house was constructed in 1930. He had originally practiced dentistry at 507 South Sanford Avenue until he moved his office to 300-302 South Sanford Avenue, where he practiced from 1926 to 1946. Judge Williams was operating his restaurant here by 1924 and Sami Boyd ran his barbershop here by 1926. Williams resided at 307 South Sanford Avenue in 1917, but he had vacated the property by 1924. By 1947, Suites 305-307 was being occupied by Howard Boteler, a wholesale confectioner. Boteler had previously been in a partner of Boteler-Jackson Company Inc., which was located at 307 South Sanford Avenue in 1926. The Boteler Howard Company, a wholesale confectioner business, was run at 500-502 South Sanford Avenue from approximately 1952 to 1965. Bill Duskin's Department Store was listed at Suite 305 in 1947 and Ezekiel's Radio Sales & Service was listed at this address in 1952. 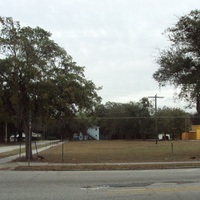 From approximately 1965 to 1975, this lot was being occupied by the Royal Palm Barber Shop. All of the occupants listed above from 1911 to 1952 were African Americans, with the exception of Boteler. At the time that this photograph was taken in January 2012, Suites 301-305 was vacant with no building. Original color digital image by Adam Rock, January 23, 2012. Originally created by Adam Rock and published by RICHES of Central Florida. Sanford, Florida City Directory, 1911. Sanford, Florida: R.L. Polk & Company, 1911. Sanford, Florida City Directory, 1917-1918. Jacksonville, FL: R.L. Polk & Co., 1917. Sanford, Florida City Directory, 1924. Sanford, Florida: R.L. Polk & Company, 1924. Sanford, Florida City Directory, 1926. Sanford, Florida: R.L. Polk &a Company, 1926. Sanford, Florida City Directory, 1947. Sanford, Florida: R.L. Polk & Company, 1947. Sanford, Florida City Directory, 1952. Sanford, Florida: R.L. Polk &a Company, 1952. Sanford, Florida City Directory, 1965. Sanford, Florida: R.L. Polk & Company, 1965. Sanford, Florida City Directory, 1975. Sanford, Florida: R.L. Polk & Company, 1975. Rock, Adam. “301-305 South Sanford Avenue.” RICHES of Central Florida accessed April 25, 2019, https://richesmi.cah.ucf.edu/omeka/items/show/3680.